★ Low profile folding design prevents from inadvertently hitting it while not in use, only protrudes 1" from the wall. 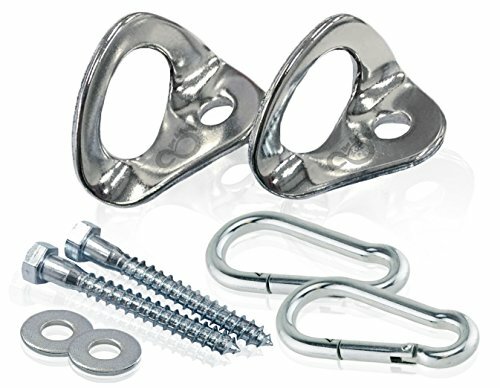 Single bolt mounting makes repairs easy if you ever decide to change the location of your indoor hammock. ★ Supports 400Lbs. each when properly attached so you can rest easy knowing you have the strongest hammock accessory on the market. It's suitable for walls, ceilings or any other location that you may want to hang out and relax! ★ Use for indoor or outdoor patio hammock hanging, included quick links make it easy to use with hammock tree straps (not included) for areas well larger than your hammock. If you have any questions about this product by Live Infinitely, contact us by completing and submitting the form below. If you are looking for a specif part number, please include it with your message.